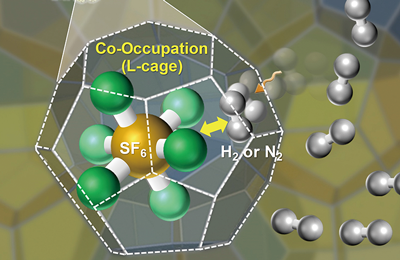 [Scientists are getting closer to finding ways to store larger amounts of hydrogen.. Improvements in performance and reductions in cost of silicon-based nonvolatile memories, such as flash random access memory (flash-RAM), have rendered floppy discs and many other forms of portable storage obsolete. But for many uses that require data to be written only once, such as archiving and security applications, their cost effectiveness is limited. So-called write-onceread- many (WORM) memories made from low-cost polymer materials could provide a solution. The devices, developed by Professors Moonhor Ree, Ohyun Kim, Su-Moon Park and their research teams, are based on hyperbranched copp..
A research team of Department of Life Science’s Center for Biomolecular Recognition and Division of Molecular and Life Science, consisting of Professor Byung-Ha Oh, Doctor Jae-Sung Woo, and Doctor Jae-Hong Lim, has solved secrets of the ring-shaped molecular structure of the MukBEF condensin, the key mediator of chromosome condensation.In eukaryotic organisms, chromosomes are found in the nucleus of every cell. Before cell division, chromosomes are condensed, and the two replicated copies of the chromosomes are partitioned into the two daughter cells. In prokaryotic organisms, chromosome..
X-ray imaging shows in real-time and in in-vivo that intensive irradiation of x-rays significantly decreases the surface tension of water in droplets and capillary tubes. X-rays are used in a variety of experimental studies of liquids, in particular, of water. The present synchrotron sources allow intense irradiation, possibly enabling to alter the basic property of surface tension. In spite of its potential impact, this issue has been still unexplored. In 1896 Wilson roughly showed that x-rays ionized the air molecules, and the electrons and ions created cloud nuclei in a cloud chamber. His c.. 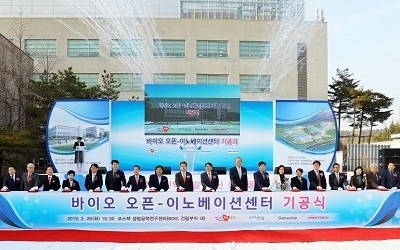 Professor Seung-Hoon Jhi and Ph.D. Candidate Seon-Myeong Choi, both of the Department of Physics, in their study of metal doped graphene nanoribbons, discovered that the adsorbed metal atoms form atomic chains which can be used as reagents to identify the edge atomic structures of the graphene nanoribbons and also as gate-driven spin valves to control the spin current in graphene nanoribbons. Graphene, the basic structural element of all graphitic materials including graphite, carbon nanotubes and fullerenes, is a one-atom-thick planar sheet of carbon atoms that are densely packed in a honeyco..
Ajoint research between POSTECH (Pohang University of Science and Technology) and Max Planck Institute of Microstructure Physics, Halle, has produced an advanced technology applicable to the development of the permanent memory, FeRAM, which can save 176 billion bits per square inch (published in Nature Nanotechnology, vol. 3, page 402). FeRAM has attracted many researchers’ interest because of its excellent characters such as nonvolatility, fast read and write, and high reliability. However, limitation in realizing large scale integration of ferroelectrics on a single chip has hindered t..
TGFβ ligands belonging to the Activin/Nodal family, induces mesoderm and endoderm, specifies the embryonic axes, promotes gastrulation movements, maintains pluripotency of embryonic stem cells, and determines left-right asymmetry in vertebrates. Activin/Nodal ligands signal through type I and type II transmembrane serine/threonine kinase receptors. Ligand binding induces the formation of heteromeric receptor complexes in which type II receptors phosphorylate and activate type I receptors. The activated type I receptors transduce the signal inside the cell through the phosphorylation of th.. The way to prevent intra-operative awareness has been paved by joint efforts of medical science and physics. Intra-operative awareness, familiarized through some thriller movies, is a unique physiological phenomenon which causes the patient under general anesthesia to recover consciousness during surgery. The patient experiencing intra-operative awareness may feel the pain or pressure of surgery, hear conversations, or feel as if he cannot breathe, but may be unable to communicate any distress because he has been given a paralytic or muscle relaxant.Professor Seunghwan Kim (Department of Physi.. Climate change caused by increasing atmospheric CO2 is a major environmental problem of the 21st century. There has been much discussion about how to reduce CO2 output and prevent global warming. In this respect, plants are an important part of the overall picture as they are primary CO2 consumers and are directly challenged by increasing CO2 levels. Moreover, plants vary in their responses to elevated CO2. Plants that adapt better to this change are expected to out-compete their neighbors, which would cause instability in present ecosystems and unpredictable changes in weather and climate.In .. The invention of the scanning tunnel microscope (STM) opened the door to nanoworld, enabling humankind to actually touch and feel the individual atoms at the surface of a material. It has inspired a series of inventions such as the atomic force microscope (AFM), the lateral force microscope (LFM), the magnetic force microscope (MFM), etc. Recently, the scanning probe microscope (SPM), which encompasses all these inventions, has evolved into the millipede technology which has a potential to make competing data storage technologies obsolete. A common denominator of these exciting developments is..
Spin-valve devices are a key component of a magnetoresistive random access memory. Mr. Woo Youn Kim and Professor Kwang Soo Kim of Department of Chemistry of POSTECH predicted supermagnetoresistance in a graphene nanoribbon device, the article of which has appeared in Nature Nanotech (3, 408-412, 2008). The reported graphene nanoribbon spin-valve device shows extremely large magnetoresistance (ten thousand times larger than that of conventional devices), which promises high speed access, and good sensitivity. The striking enhancement originates from the peculiar symmetry of band structures of ..